Visual Website Optimizer’s integration with Google Analytics is automatic, which means you don’t have to modify your existing GA or VWO only in anyway. While creating a test, simply enable this integration option with the click of a button. What this integration does is that it pushes VWO variation data into GA’s custom variable report, so you can segment any report in GA with an additional segmenting option. Once you enable the option in test settings (under accounts) or during creating a test, Visual Website Optimizer will automatically pass the variation data of the Variations to the Google Analytics. 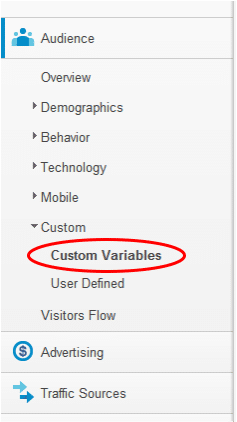 GA Slot: This is the custom variable slot in Google Analytics that you want to use for Visual Website Optimizer. If you are unsure what this means, leave it as it is. GA Account Prefix: In case you are using more than one Google Analytics account on your website, specify here which Google Analytics Account Prefix you want VWO to be integrated with. This is an optional field and should be left empty if you are unsure. Please read more about it on our helpbase. By default, the plugin will work perfectly ONLY if you have one test running on your website running at a time (the limitation is because Google Analytics provides limited slots to store customer variables). In order to track multiple tests simultaneously, see the technical note below. The reports you see in Google Analytics are indicative, at best. GA won’t show you statistical significance for any result – so interpret the results with care. Unlike VWO, Google Analytics reports aren’t realtime – so allow atleast 1-2 days for data to show up in GA reports. You can add the integration code site-wide (even on the pages where VWO is not running). The plugin will not affect your GA tracking in any manner. Leave a comment here if you cannot get the plugin to work for you or you have trouble understanding what code to add or where to add. This manual integration does not work with Visual Website Optimizer’s asynchronous code aspect. Hey David, I can help you with the integration if you want. Thanks Paras. It’s on my task list. Which of the 5 slots do you use? Can we configure that? VWO uses slot 4. Currently it isn’t possible to customize that but would you like to do it? Well, sometimes we use something like gaTracker instead of pageTracker, and sometimes we use the async version of the Google Analytics tracking code. And some clients already use slot 1 to 4, and then it’s good to have a choice. Great idea, we can easily build that feature into the integration code. Let us know when you are on it. Just want to say that this is a killer integration. Reeeaaaally love this. Yes, in the next version (coming out this week) we will be providing a code snippet that allows specifying which slot to use. Stay tuned! To all who requested GA custom slot, updated the code and post to allow that! We’re using Google Analytics asynchronous tag. Is the integration of VWO will be the same as the code you show upon? No, it won’t be the same. Just wait a couple of days – we are releasing a plugin compatible with Async code. Any reason why this doesn’t work? The code doesn’t yet work with asynchronous GA snippet. We will be soon updating the VWO code to make it work. Will keep you informed. UPDATE: It is now possible to use VWO plugin with GA asynchronous code snippet. See the update in the post. Do you have a plug-in that works with getclicky.com now? No, not yet. Are you looking forward to that? Even if there isn’t a plug-in, is it possible to use your tool with GetClicky? Alex, yes of course, you can use it with Clicky. There will be no conflicts. Thanks Paras, worked a treat, in that there are no errors. Looking forward to seeing the results in GA! Is there a known issue with _vis_opt_GA_track() causing visits to become treated as new visits (and thus jacking the bounce rate up to 100%)? This is really mauling our Analytics data. I’m guessing it’s some weird interaction with our setup, because third-party Analytics integration has done this in the past before, but I have no idea how to debug it. I don’t understand how I track multiple tests – sorry! Do I simply add that code snippet at the top of every page to change it to ‘5’? @David: change what to ‘5’? Can you email us at support@wingify.com? Thanks always for sharing your ideas so freely and moving your platform forward with such agility for all of us to benefit. @Hi John, why don’t you mail me and then we take from there? Can you please help me get this up and running? Can you please add this page/content to the help section? I keep trying to search for it and don’t find it. @Anne: Thanks for pointing it out. Just adding the article. Is it in the near future going to be possible to run multiple tests at the same time? @Zorg: yes, we are planning to update the snippet to allow for multiple tests. Am I reading this correctly? I have a multiple URL based tests running on my site for a template test across course pages. I also have a goal page tracking in the test. The goal is picked up by VWO, but I’m not seeing the goal tracking in GA. Is this because I have 29 individual tests for the course template split test and GA will only show the goal results if there is one test running? The plugin is working for other queries. All 29 tests are on Custom Var 4. The solution is using synchronous snippet, but I still hope this can be resolved somehow (e.g. by ordering calls to VWO and GA scripts). @Vasil: yes, we do have plans to make GA async work with GA script. Edit: The GA async integration now works perfectly.